One of the things that I have learned in writing this blog is that there is an enormous amount of data out there to draw from. I have only touched on a few titles so far, and there are many, many more to explore. Today though, I am going to stay in “Marvel country” and take a look at some more Silver Age goodness from the Amazing Spider-Man! I presently have a graph in from of me that runs from issue 20 through issue 60. But I am going to present it installments so as not to get lost in a veritable sea of information! Issues 20-34 yield a few interesting observations that are worth discussion…so without further delay, let’s take a look! First off, as with a lot of the other data we have looked at for Fantastic Four and Thor, there is a clear anomaly with the data on issue 33. It has all the hallmarks of a book that was subject to a warehouse find – a far greater number of 9.8 issues than neighboring numbers, and a lot more books in higher grade overall. The case is strengthened by noting that nothing really important happened in this issue and that the Guide 9.2 price is fairly low compared to surrounding books. Another thing I see here concerns the more sought after issues 23 and 28. Issue 23 was the third Green Goblin, and he is on the cover. 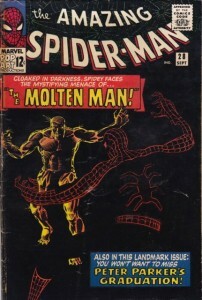 Issue 28 is the origin and first appearance of Molten Man. Each book is collectible for those reasons alone, so one would expect a bump in CGC submissions for grade and a corresponding bump in higher grade copies. But, we don’t see that here. The take-away? These books are popular AND not very common in high grade…two things that will make these books fairly pricey to get in high grade. 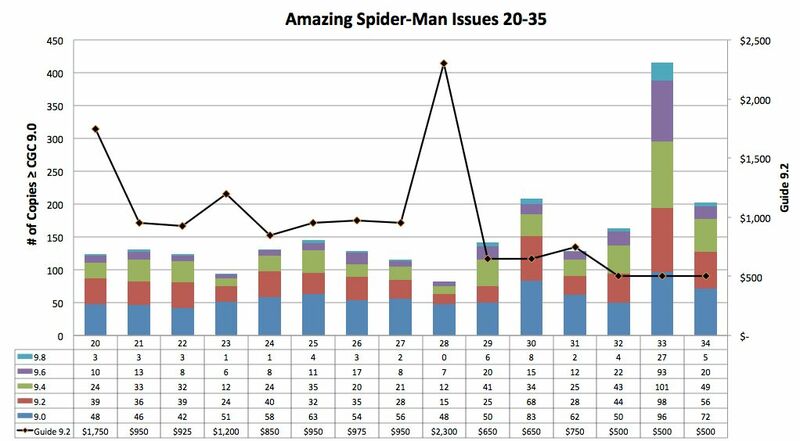 Interestingly, if you look at the number of books graded CGC 6.0 or higher for issues 23 and 28, each issue has more graded copies than issues 24-27. So…a lot of books have been submitted, but not a lot of high grades awarded. For issue 28 this is likely explained by the black cover. As to issue 23, I am not sure why there are relatively few high grade copies out there. There is more to take away here, but these are the two main points. If you have a GP Analysis subscription, it’s worth comparing this data to current 12 month average prices realized. The GP data correlates rather well to the conclusions drawn here. P.S. Looking for Silver Age Amazing-Spider Man in CGC 9.0 or better?